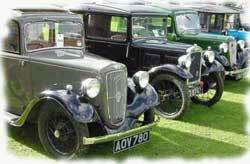 NECPWA North is the home of the Tyneside and Durham Branches of the North of England Classic and Pre War Automobiles Motoring Club. (originally founded as and formerly known to everyone as the North East Club for Pre War Austins.) The North's Foremost Classic Motoring Club. The Club accepts all makes of vehicles and types of cars and motorcycles and we have members who own different makes of vehicle (sometimes more than 1). 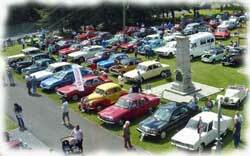 Membership is open to any enthusiast of old motor vehicles. It is not necessary to be a vehicle owner to join the club, but attendance at Club organised rallies is generally restricted to vehicles produced over 18 years ago. [NB each event has its own entry rules]. We encourage the formation of Local Branches of the club. Local branches being responsible for running their own events, and have their own representatives on the Executive Committee. Main Club membership is spread over a very large area, mainly in the North of England and South of Scotland although we even have members overseas! Members come from all walks of life, united by common interest. We are proud of our friendly, informal outlook and we hope that You will decide to join us, and keep those old wheels turning.